Maverick Transportation is a Little Rock–Arkansas based transportation and logistics company. 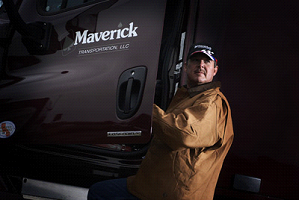 Maverick operates over 1500 trucks coast-to-coast, in Canada and to Mexico providing customized logistics solutions. Logistics solutions are provided through variety of trucks such as Flatbed, Pneumatic, Temperature Control, etc. Maverick has a mission to deliver the highest quality services by selecting, training and supporting the best drivers in the industry. It has a program which aims at having drivers at home on weekend. Maverick needed a system which can help the Fleet Managers to achieve the aim of this program. The Maverick Fleet Managers have to balance customer demands, equipment and promises to the drivers to “get them home on time”. One of the ways to balance these needs is load swap among the drivers. The process of changing drivers (known as ‘Swap’) involves multiple steps of identification, selection and cost benefit analysis to make the right decision for the customer, the driver and for Maverick. Also, to ensure highest quality of service to their customers, Fleet Managers needed plan for Repower (dispatch the load through another truck) and Relay (ensure the load keeps on moving continuously through sequence of drivers). The whole process requires experience and expertise about the geography, routes, loads, drivers, etc. In order to streamline the process, Maverick wanted Decision Support System to make a good decision. Completely remove dependency on multiple tools for calculation, analysis, etc. Maverick wanted to have minimal capital expenditure on platform. CyberTech implemented GeoServeTM as a decision support system to help the Fleet Managers in making quick and precise decision. The solution is a web-based system which provides intuitive visual interface for the identification of swap candidates. This system makes it easier for a Fleet Manager to find out which driver requires swap, identify good candidates for swap, perform what-if analysis to understand cost-benefit analysis, identify possibilities to repower and ensure relay of the load. Reference data such as truck terminals and drivers’ home location was set-up in ArcGIS Online. The web-based front-end performed complex geo-spatial analysis to identify and suggest the best candidates for swap, repower and relay. Provide map based visualization of the routes, driver home locations, etc. The solution used ArcGIS Online services as one-stop shop for all GIS needs. ArcGIS Online was used to store all the GIS data related to routes, driver home, etc. ArcGIS Online routing service was used to generate the route and to calculate the extra miles required to be travelled in each option available for the driver. ArcGIS for WPF based application ensured that the routes (line features) are available for analysis based on the latest route plans. One of the US County’s Office of Economic Development (OED) had a business goal to attract new businesses in the county. CyberTech implemented its GeoCivic product to achieve OED’s vision. GeoCivic’s web-portal aims at helping the businesses to find viable locations within the county by considering various factors including economic zones, transit routes, demographics and competition. The County is located in United States and is the second most populated county in the state. This County has a population of more than 800,000 spread over 322 sq. miles of area. The County’s Office of Economic Development had a primary mission of encouraging businesses to invest in the county by moving into vacant space and taking advantage of economic incentives. CyberTech implemented GeoCivic, an extremely powerful, visually intuitive, web-enabled, map-based solution, to address OED’s challenges. GeoCivic leverages ArcGIS platform, integrates with external data-sources such as Business Analyst Online, ArcGIS online, real estate websites, external databases, etc. and provides a web-based portal for ease of site selection. GeoCivic data-base is designed to leverage ArcGIS for Local Government (AG4LG) data-model. 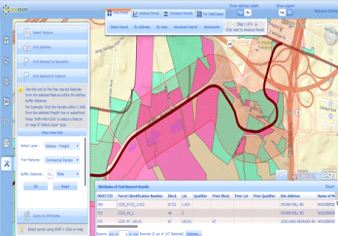 AG4LG data-model is known as the industry best practice for GIS data management. Various data utilities available with GeoCivic helped in easy set-up, refresh and management of data. GeoCivic consists of spatial analysis tools (GP tools) which perform analysis such as proximity to nearest transportation facility and make it readily available for on-demand visualization. GeoCivic web-portal provides a map-based web-interface for searching the sites, viewing the analysis results, comparing different sites, understanding factors critical to identification of site such as various incentive zones, site details, transit points, demographics, property-listing, etc. Analyze parcels based on incentive zones, county data, nearby transport, etc. 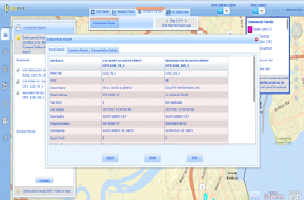 Provision to display geographic features such as rail lines, highways, ports, etc. Visitor statistics report for county admin to analyze website usage, area of interest, source location of users, etc. 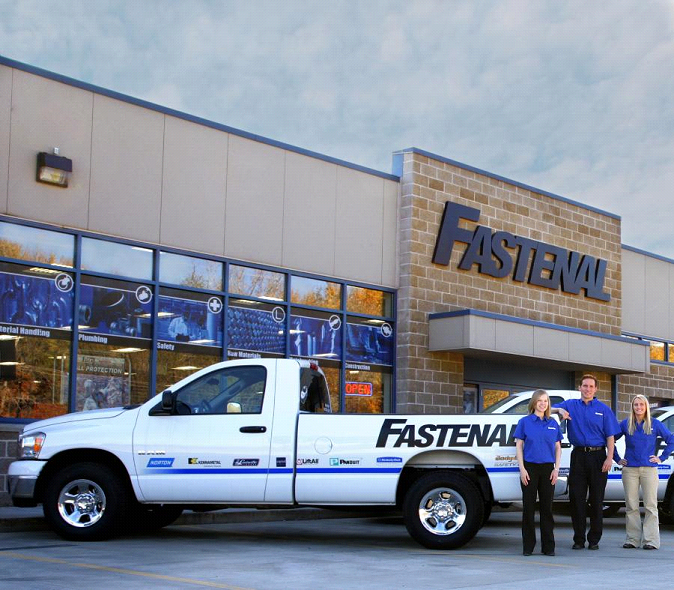 Fastenal is an industrial supply company based in Winona, Minnesota. Fastenal distributes industrial, safety and construction supplies and also offers third-party logistics and inventory management services. Company has a nationwide network of 2600 retail stores. The distribution process is monitored and managed by Fastenal’s Ground Traffic Control (GTC) group. Distribution is managed through more than 400 trucks dispatching supplies on 250+ routes throughout USA and Canada. There was a need for a system which efficiently monitors the trucks and also alerts about possible delays. Fastenal’s primary business depends on efficient and timely distribution of product to customers. 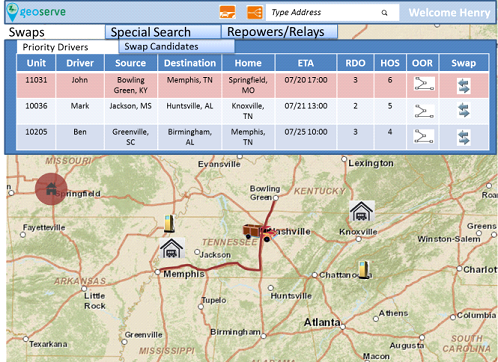 GTC defines routes, dispatches drivers, supports decision making about dispatch, and monitors deliveries. Much of the product moves over night to meet target delivery dates at each store early in the morning. To improve communication, reduce wait time, and reduce the need to staff, Fastenal wanted a system that will automatically monitor the delivery fleet and notify GTC operations, regional managers, store managers and sales staff about product delivery, current fleet traffic, known delays and known hazard conditions. Prediction of delays due to traffic congestions, unfavorable weather conditions, etc. CyberTech implemented GeoServeTM cloud offering which provides combination of IaaS, PaaS and SaaS. The solution was hosted on cloud-server and used ArcGIS Online to satisfy all the GIS data & service needs. A server-side application which continuously monitors the trucks, predicts possible delays due to adverse weather conditions, calculates the delay based on actual truck position and notifies the relevant personnel through e-mail. In order to avoid capital expenditure, the solution was based on ArcGIS Online services. ArcGIS Online was used to store all the GIS data related to stops and routes. Web-interface provided ability to upload the routes as sequence of stops. ArcGIS Online routing service was used to generate the route to be adopted by the trucks to service the required stops. This route was used for calculation of delay. ArcGIS for WPF based application was installed for continuous monitoring of the trucks, identification of delays and predictive analysis based on weather forecast services from Esri and NOAA. This application interacted with the third party services to provide the GPS locations of the trucks at regular intervals.